You are browsing the archive for hawaiian music. Selection of tracks recorded by the Hawaiian Quintette for Victor in 1913, series of recordings which went a long way toward establishing Hawaiian music as a significant genre on mainland US. 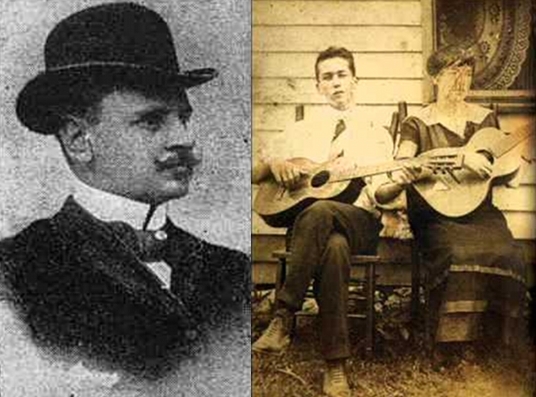 Instrumental Hawaiian guitar version by the Louise and Ferera Hawaiian troupe of Alberto Pestalozza’s oft recorded classic “Ciribiribin” originally composed in 1898. Frank Ferera is considered to be the first great star of Hawaiian music. Ferera first visited the mainland United States as part of the Keoki E Awai troupe, and gained fame with the troupe by performing to an estimated 17 million people in a seven-month period at the Panama-Pacific Exposition in San Francisco in 1915. He married Helen Louise Greenus, daughter of Seattle businessman Albert E. Greenus, and as the Louise and Ferera Hawaiian troupe toured with her throughout the USA, in 1915 signing up to Columbia Records. “Ciribiribin” was to be one of the very last songs they recorded together. In December 12, 1919, Helen Louise mysteriously disappeared while the couple were on board the steamship SS President, from Los Angeles back to their home in Seattle. She had apparently gone on deck for a walk at 4 a.m. and never returned.